We never viewed cornstarch as much more than a cooking ingredient used occasionally for thickening sauces and soups, but it turns out this everyday item adds a quick boost of power to your beauty arsenal. Thicken mascara by mixing a dollop with a dot of cornstarch on a plate, and apply with a mascara brush. Add one eighth of a teaspoon to nail polishes and lip colors to achieve a matte look, or substitute dry shampoo with cornstarch to cut sebum. 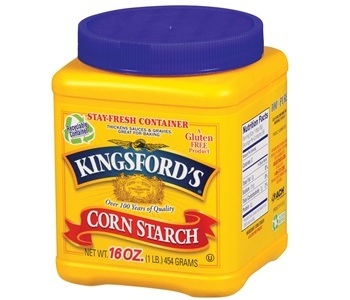 This entry was posted in Beauty, Budget and tagged Beauty, cornstarch, Cosmetics, diy, Makeup. Bookmark the permalink.